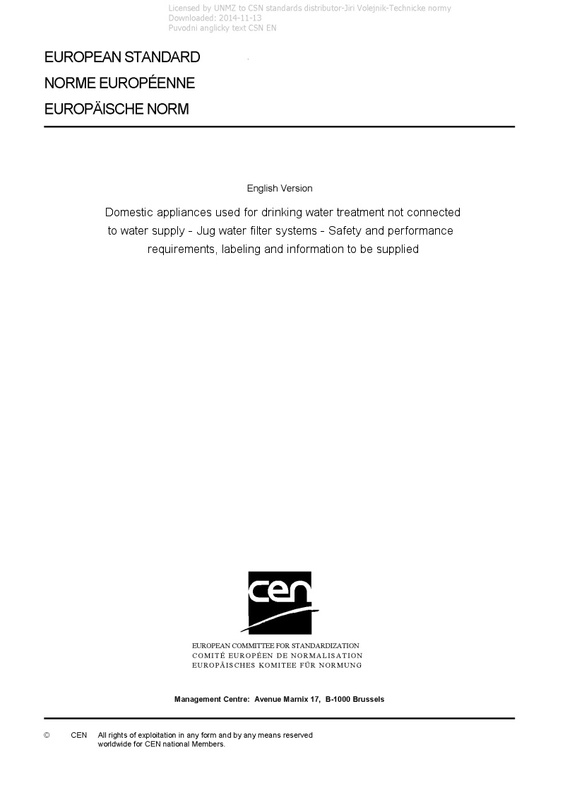 EN 17093 Domestic appliances used for drinking water treatment not connected to water supply - Jug water filter systems - Safety and performance requirements, labeling and information to be supplied - This European Standard describes the specifications and test methods for gravity fed devices for conditioning of drinking water that are not connected to the mains water distribution system in buildings, known as jug water filter systems. It also gives instructions for the user manuals, so that the jug water filter system can be used and maintained properly. Jug water filter systems are intended to modify the properties of drinking water only, and are not designed to make non-potable water safe for drinking. The scope of this document does not extend to combination systems that require an electrical power supply such as water heaters and water coolers systems. NOTE 1 Although jug water filter systems are covered by the widely harmonized food legislation (EU Regulations 178/2002 and 1935/2004), existing national regulations concerning the use and or the characteristics of these products remain in force NOTE 2 This standard provides no information as to whether the product is used without restriction in any of the Member States of the EU or EFTA.